He's made up his mind and will definitely travel to Heathrow tomorrow for a confrontation with the weak, pusillanimous Labour Government that's holding on to dear power by a thread. 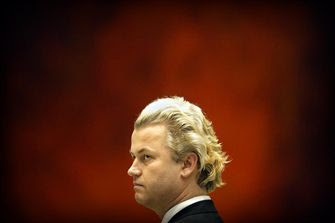 Wilders cannot lose. The British authorities can nothing but lose. Either they give him a pass and they look pretty much like the Metropolitan police -- foolish and ineffectual; or they lock Wilders up and the world will know them as politically correct traitors to liberal democracy. There's a third possibility. CBN News veteran, Dale Hurd who interviewed Wilders last year, thinks the Brits won't make the fatal mistake of jailing Wilders: "No, I don't think the British will arrest Wilders, but it certainly looks as if they may block his entry". The defender of liberty for his part cannot wait to find out just how cowardly they are. Wilders - who for years hasn't been able to move without security detail - has drawn energy from the British stance - he's more determined than ever before. Protests by the Dutch Government to date have had no effect. Dutch parliamentarians usually share some of the ambivalence towards Wilders' critique of Islam: the postmodern contempt for truth, disregard for facts, and a need to unquestioningly throw their weight behind minorities, no matter how wrong or downright evil they may be, all willingly sacrificed in the service of the blanket belief that compromise is the panacea for all of the world's ills. But now the censorial British position has rekindled the rebel in the Dutch national character: Parliament is behind Wilders to a man! Hurray - the spirit of Cartesianism is animating the low lands once again. Fitna will do nothing towards an intellectual debate, so why show a film he himself is not going to waste time on seeing? We are to rest assured that his authorities will send Wilders back to where he came from. The anchor wrapped up the interview with the scrap of news that British Midlands - Wilders' carrier of choice - has a strict policy not to take passengers on board who have been declared unwanted by the British authorities. So we are not to be surprised if Wilders doesn't even get off Amsterdam airport. Help this man out! JD. Keep an eye out for Lord Nazi's sentencing on February 25th. Guess What? Wilders = Al Qaeda! Energizing the Base: America and Europe!